Sony LF-S50G review | What Hi-Fi? If you aren’t already barking commands at a smart speaker, it surely won’t be very long until you are. What was once a niche prospect has quickly become a mainstream proposition, with many big manufacturers rushing to add smart stuff to their speakers in time for Christmas. Standing taller than it is wide, with a cylindrical design and fabric grille, Sony’s design for the LF-S50G is not exactly revolutionary. However, with the smart speaker gene pool as it stands, it’s hard to find any genuinely unique features on any of them. Panasonic's equivalent isn't cylindrical, which is enough for it to look exotic. What matters is that the Sony looks lovely, with softly curved edges at the top and bottom. It's a nice, compact size, and the option of black or white finishes will help it slip it into your home unnoticed. One standout feature – quite literally – is its illuminated clock, which shines through the speaker’s fabric grille. You can choose how bright you want it via the S50G’s dimmer switch, which Sony has placed on the base of the speaker. There are a few other bits of design flair, including the LF-S50G’s gesture controls. Swipe your hand over the top of the speaker to skip tracks or call up the Google Assistant, or perform a finger-twirling motion over the top of it to adjust volume. It adjusts in single steps rather than the jumps of five that upping it from your device will, but it is a bit hit-and-miss as to whether it recognises your gestures accurately, which is frustrating. Ultimately, we’d prefer no touch controls to something as temperamental as this. As well as casting from devices and controlling music playback using your voice, the LF-S50G also features Bluetooth for a streaming from services that don’t support casting. The button's for on the bottom, near the power. There’s also multi-room functionality via the Google Home app, which lets you link the LF-S50G to any other cast-capable speaker the app finds on your network. Google Assistant has had some time to play catch-up with Alexa, and now even carries some extra functionality Alexa isn’t quite as good at just yet - like controlling your TV. The wake phrase for the speaker is “Okay Google” or “Hey Google”, and you set up voice recognition when you set up the speaker using the Google Home app. Google Assistant can get to know up to six voices, so the whole family can configure their music and Google accounts for a more personalised experience. The services you can currently set up within Google Home include music from Spotify and Google Music (you can set your default service here too), and there’s TV playback via Netflix and YouTube. Once you’ve plugged in your account details for these services, you can simply ask the LF-S50G for any playlists, genres or individual songs, or get it to pull up a specific show. You’ll need a Chromecast dongle connected to your TV for the latter to work (or an Android TV from Sony or Philips with the functionality built in). This works brilliantly, and takes care of all the switching from our Sky box to the Chromecast input on our amp. If you request a TV show on Netflix, it will go to the latest episode you haven’t watched (or pick up where you left the last one). A movie will do the same, starting from the beginning if you’ve never seen it or kicking off where you left it last. Just as with music, you can control playback using your voice too – skipping forward a minute or saying "pause". If you ask it to play YouTube, it will start playing recommended videos from your account. Voice recognition and understanding is good. Even from across the room with loud music playing, it only fails to pick up what we are saying a few times. There are a handful of occasions where the Assistant doesn’t recognise our voice to give us personal information (“what’s on my calendar?”, for example). We take a minute to retrain it with our voice in the app and it works fine from then on – worth doing if you encounter any issues. Of course, as well as controlling your music and TV experiences, the Google Assistant is able to control any other smart home devices connected through Google Home, like thermostats or lights from Nest or Hue. It’s also able to give you traffic updates, walk you through recipes, answer questions and set reminders and alarms – and these capabilities are improving all the time. Try asking it to play a game or tell a story. It’ll even flip a coin for you and can read you the news. Its jokes aren’t up to much, however. Speaking to Google Assistant is a natural experience (as far as smart assistants go), and there is a bit of fluid back and forth - for example, when asking to set a reminder or calendar appointment. There are moments where it feels almost like an actual conversation, which is a step in the right direction and something Alexa hasn’t quite managed yet. Alexa still has the edge on the number of other things she can play with, but the gap is narrowing all the time. Despite Google Assistant taking the fight to Alexa, Sony’s usual sound prowess doesn’t shine through on the LF-S50G. It struggles to hold its own against the Sonos One. The way its 360-degree sound spreads into the room, using dual-facing drivers and a two-stage diffuser to do so, is initially impressive. But listen longer and you realise that, despite a decent breadth of sound, it’s actually quite a small, closed-in performance that isn’t able to deliver the same amount of scale as the Sonos One. The midrange is forward, but fragile. It lacks the confidence and solidity of the more assured Sonos. Listen to James Brown’s The Boss and instead of authority and swagger, the LF-S50G is on the thin side. Vocals lack the insight and detail dished up in spades by the Sonos One. It’s a touch relentless too. The crisp, forward nature of its midrange means it’s never the most relaxing performance, but the marginal quality turns it into a sound that's quite tiring over longer listens. This teams with some sibilance at volume to make the speaker sound a little pushed and out of its depth. Position close to the wall and you'll get some much-needed weight out of the LF-S50G to balance this out. But you don't gain any of the precision, impact and warmth of the Sonos One, which imparts a sense of solidity across the rest of the frequency range. It isn’t able to tie all the parts of a song together with the same natural ability, either. 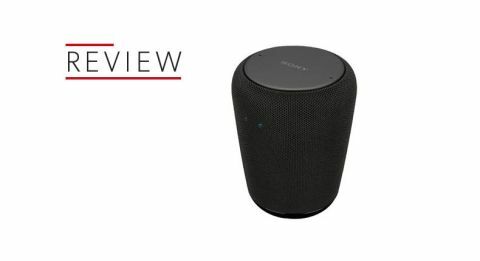 Looking at the Sony LF-S50G from a purely smart speaker perspective, there is a lot to like. Google Assistant is making big strides towards overtaking Alexa - in some ways, it's already doing so. We love the more natural conversations we can have and its breadth of capabilities – it gives Alexa something to keep an eye on, which always works out well for the consumer. However, with its promise of high-quality audio and a price tag to match, we can’t help but be disappointed in the LF-S50G’s sonic performance. Sure, it sounds better than the Amazon Echo (£70) and Google Home, but it doesn’t come close to matching the Sonos One. With a significant price drop, the Sony LF-S50G could be worth considering - but while it sits shoulder-to-shoulder with the Sonos One (which itself has Google Assistant functionality coming in the new year), it is poor value and struggles to make a strong enough case for a place on our audition list.